You are currently browsing the The Pet Product Guru blog archives for October, 2018. It’s Halloween and a fun time for kids and adult alike but is it a fun time for our pets? We dress them up take them out to parties, parades etc but we must ensure that they are kept safe at all times. 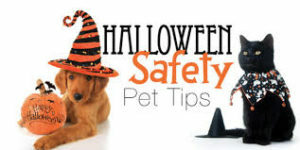 Pet MD has put together a comprehensive guide to pet Halloween safety. Please take a look at their article right here to make sure that you have their safety covered. All forms of chocolate—especially baking or dark chocolate—can be dangerous, even lethal, for dogs and cats. Symptoms of chocolate poisoning may include vomiting, diarrhea, rapid breathing, increased heart rate, and seizures. 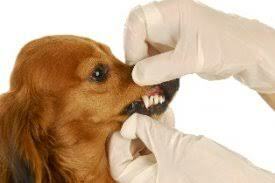 Halloween candies containing the artificial sweetener xylitol can also be poisonous to dogs. Even small amounts of xylitol can cause a sudden drop in blood sugar and subsequent loss of coordination and seizures. “Xylitol ingestion can also cause liver failure in dogs, even if they don’t develop symptoms associated with low blood sugar,” adds Dr. Jennifer Coates, veterinary advisor with petMD. And while xylitol toxicity in cats has yet to be established, it’s better to be safe than sorry. The best variety of oldies are on Edgewater Gold Radio. Take us along wherever you go by downloading the free Edgewater Gold Radio app. Listen on Live 365, Tunein, Myradiotuner or tell your google or Amazon Echo device to “play Edgewater Gold Radio. Listen to Edgewater Gold Radio from our website: Edgewatergoldradio.com. Can Feral Cats be Learn to Live Indoors? Feral cats are the ones that survive outdoors. They are continually hunting and looking for food. These cats may seem like they need a good home. Cat we ever really tame a feral cat? My cat Mollie came from a family of feral cats that lived in the swamps behind my apartment complex. I found her when she was only 5 weeks old. She lived her whole life indoors in a comfortable, loving home. If you have other pets, how will this feral cat get along with them? First, lets talk about the taming part. Animal behavior experts say that some feral cats can adapt to domestic life. Prepare yourself for some touch and go moments and maybe even some disappointment. Chances are, you missed that early socialization period. 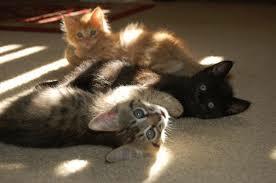 The first weeks of a kittens life are the ones where they learn to deal with others, including humans. A feral kitten will adapt easier than a full grown cat. On the other hand however, a feral cat may just adapt better with the pets in your home. It’s life in the wild has taught it the survival value of cooperation. So give it a try. In a few weeks, you may see your new pet playing with his cat toys and enjoying his life indoors! The music is flowing on Edgewater Gold Radio! Your place for the best variety of oldies anywhere! Download the free Edgewater Gold Radio app or listen from our website: Edgewatergoldradio.com. add comment Comments Off on Can Feral Cats be Learn to Live Indoors? In a world that is so divided, where people have become so addicted to technology that they’ve lost all methods of communication except by that of their fingers, we discover that people whom we think we know, exhibit disappointing behavior that leaves us empty and wanting to cling to our own comfort zones. In many cases that comfort zone is our pets. A pets unconditional, unchanging love provides us with peace and consistency in our lives. People change, deceive and disappoint constantly that as I get older I find myself spending more and more time alone or at home with my cat Millie. I sometimes actually am more comfortable by myself. I go where I want, do what I want and don’t have to deal constant disappointments. Pets provide peace, harmony and unconditional love all the time. They will never disappoint. That’s a reason why my partner and I love and treasure our pets and will eventually add to our pet family, stay tuned! Playing the greatest oldies of all time! Edgewater Gold Radio, they best variety and mix that you’ll ever hear! Download the free Edgewater Gold Radio app or listen from our website: Edgewatergoldradio.com. Removing pet stains from furniture and runs. Make sure that you pet name and characteristics are on the listing sheet. Remove odors if any exist. Make sure that doors are not left open during showings if the owner is not home. When I sold my home, I discussed the fact that I had a cat. A big note was posted to the door telling the real estate agents and prospective buyers not to leave any doors left open and to close the door behind them. If a dog is present, the owner must be home during the showings. Keep dog , cat beds and accessories in the appropriate places, not in the middle of a room. Pets are part of our families and a part of our lives. It takes months to sell a home and the comment about boarding your pets during this time is really being cruel to the animal. I realize that having children and pets could slow down the process a bit but hey, they are a part of our lives. If a Realtor insisted on me getting rid of my pets during the time that my house was up for sale, I would just find another Realtor. 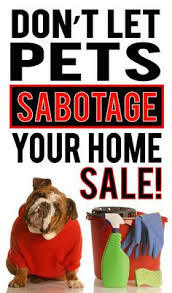 The Realtor also mentioned that you could include your pets as part of the sale!!! I really think that this women does not like pets. Our pets are not like pieces of furniture and her insensitive remarks made me question her qualifications. My feelings, if you take the time and prepare properly and have a plan for your children and pets during showings, your house will sell. If someone likes it, pets won’t turn them off and if they do, they would probably be very very difficult buyers who will drive you nuts during the process anyway. Enjoy the greatest oldies of all time today! It’s a 60s and 70s weekend on Edgewater Gold Radio! Download the free Edgewater Gold Radio app or listen from our website: Edgewater Gold Radio.com. Are you ready to add a furry little friend to your family? The first thing you think of is where is the best place to adopt? Where do I start looking? Realsimple.com has put together a great article that will help to solve your problem. There are many places to consider and this article may help you get going. We wish you luck in this process. 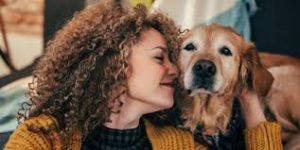 The pet adoption approval process typically involves an application and interview; some organizations also require a home visit and a veterinary referral. If you think you’re ready to find the perfect companion, check out these online and in-person sources. What it is: Petfinder.com provides a searchable list of pets from thousands of shelters and adoption groups around North America. Started as a New Year’s resolution by its two co-founders, it enables shelter animals to have exposure to potential adopters 24 hours a day, seven days a week—and it was the first of its kind. How it works: Go to Petfinder.com and plug in your search criteria, including your location. Petfinder doesn’t advocate sight-unseen adoptions, but with over 350,000 pets at any given time, chances are you’ll find one in your own area. Why it’s unique: “Petfinder allows people to take their time when searching for the pet that’s right for them—without having to stand in a shelter and feel pressure or guilt,” explains Kim Saunders, vice president of shelter outreach and public relations. “You can go through [the list of homeless animals] on Petfinder with both your head and your heart.” Most of Petfinder’s animals are cats and dogs, but rabbits are close behind—and you can even find less conventional pets, like pigs, tarantulas, sheep, frogs, horses, snakes, and alpacas. What it is: Adopt-a-Pet.com is North America’s largest non-profit homeless pet adoption Web site. It began in 2000 as “1-800-Save-a-Pet.com,” a program to help end the overpopulation of animal shelters in Los Angeles; today, over 12,000 animal shelters, rescue groups, SPCAs, and humane societies use its free service to advertise their adoptable animals. How it works: Go to adoptapet.com, enter your zip code, and search its database for the perfect pet or for a shelter or rescue near you. Why it’s unique: In addition to dogs and cats, Adopt-a-Pet.com lists rabbits, gerbils, ferrets, hamsters, farm animals, amphibians, and birds. Don’t see the animal you want? Check out the “Search Saver” feature, which sends you alerts when an animal that matches your criteria is entered into its system. What it is: Best Friends Animal Society was founded in 1984 by a group of animal lovers who refused to accept that humane societies and shelters “had no choice” but to kill unadoptable animals. Its headquarters in Kanab, Utah now runs the largest no-kill sanctuary in the United States. There’s also a branch in Los Angeles. How it works: Go to bestfriends.org and browse through the available animals. Not located near Kanab or L.A.? That’s okay: Best Friends transports animals to adopters all across the United States and Canada. Why it’s unique: Want to get up-close and personal with the thousand-plus animals—from dogs and cats to horses, pigs, ferrets, parakeets and beyond—at the Kanab sanctuary? Reserve a guided tour or sign up to volunteer. You can even spend the night in one of the on-site guest cottages or cabins, or on an RV site. What it is: Hearts United for Animals is a national no-kill animal shelter, sanctuary, and animal welfare organization situated on a 65-acre farm in Auburn, Nebraska. It seeks to comfort homeless animals by providing warm beds, good food, medical care, and love. How it works: Go to hua.org and browse through available cats and dogs. If you don’t live near the shelter, the organization will handle transportation for your new best friend if appropriate. “We will fly the dog out in cargo if the flight is safe, the weather conditions are right, and the dog has the right health status to fly,” says adoption coordinator Tera Bruegger. Why it’s unique: Hearts United for Animals focuses primarily on dogs, especially those rescued from puppy mills and natural disasters, as well as long-distance adoptions. How it works: Stop by your local Petco or PetSmart to find out about upcoming adoption events or see adoptable animals in person. At Petco in New York City’s Union Square, for example, you’ll find home-seeking cats and kittens from KittyKind, a local cat rescue and adoption organization. All PetSmart adoptions are through PetSmart Charities, a separate non-profit organization that teams up with more than 2,000 adoption partners; they operate adoption centers in all PetSmart stores in North America. Why they’re unique: PetSmart Charities facilitates 10 percent of all pet adoptions on the continent; a pet is adopted every minute that a PetSmart Charities Adoption Center is open. And Petco, along with its Petco Foundation, helps find homes for more than 250,000 pets each year. What it is: The American Society for the Prevention of Cruelty to Animals (ASPCA) was the first humane society established in North America; it’s still one of the largest in the world. “Our organization was founded in 1866 on the belief that animals are entitled to kind and respectful treatment at the hands of humans, and must be protected under the law,” says Gail Buchwald, senior vice president of the ASPCA adoption center. How it works: Visit its NYC adoption center or browse through its available animals at aspca.org. 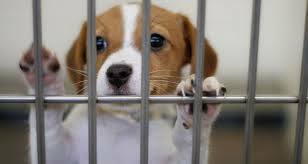 The ASPCA doesn’t ship dogs and cats, however, so if you can’t travel to NYC to pick up your new pet, try your own local animal shelter. What it is: Many dog lovers think that rescue organizations only offer mixed-breed pooches. Not so! You’ll find many purebreds, including those that have been abandoned by their owners. There are also rescue organizations dedicated to a specific breed. How it works: Have a dog breed in mind? Check out this list of breed-specific dog rescue organizations, provided by the American Kennel Club. Why it’s unique: From Airedale Terriers to Cocker Spaniels and beyond, you’re bound to find a rescue organization for your favorite breed on the AKC’s list. What it is: In addition to volunteering at your local animal shelter, consider “adopting” a pet without taking him or her home by sponsoring an animal with monetary donations. How it works: Many rescue organizations offer some type of pet-sponsoring program, including Petfinder.com Foundation, the Helen O. Krause Animal Foundation, and Animal Friends Rescue Project. Simply send a donation to support an animal that’s tugging at your heart strings, or let the shelter choose the animal that needs your support the most. Your dollars typically go towards food, medicine, and other expenses for the animal you’ve virtually sponsored until he or she finds a permanent home. The organization may send you a photo, a letter of appreciation, or occasional health and adoption updates; some shelters even post a plaque above the pet’s cage to honor certain sponsors. Why it’s unique: You can still help an animal in need, even if you’re not ready to add a pet to your family or have a full house already. Remember, your pets count and thanks to Realsimple.com for providing this valuable information. Listen to the greatest oldies of your life in one place. Edgewater Gold Radio. We’re easy to find on Live 365, download our free Edgewater Gold Radio app, listen on Tunein, Nobex, Radio Garden and many other places. You can also listen from our website: Edgewater Gold Radio.com. A healthy cat usually has a healthy appetite. If your cat suddenly stops eating, these are the things that you should look for. Is he still drinking water? Is he lethargic? Is he vomiting or have diarrhea? If he appears fine and is drinking, he may be having a couple of “off” days. Try moving his food to a quiet place, or adding some wet food to his diet. Try giving his some cat treats. If he does not start eating normally in two days, contact your vet. There could be an underlying cause that needs treatment right away. If he is vomiting, or has diarrhea, get him to the vet immediately! If you wait too long, it may be too late. Cat illnesses come on very fast and can really take it’s toll on your cat. The best variety old oldies play all the time on Edgewater Gold Radio! Listen from our website: edgewatergoldraio.com. Did you now that over 40,000 pets perish each year because of house fires and other disasters such as floods or hurricanes? 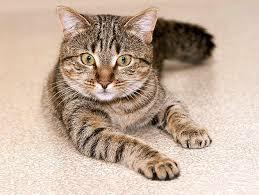 Cats run and hide very easily and this makes them difficult to locate them in the event of a fire or quick evacuation. I would recommend that you keep their pet carrier close at hand and close to the door. At least you won’t have to worry about searching for it if you need to get out in a hurry. Don’t spend too much time, I know this is difficult, but in the event of a fire, every second counts! If you can’t find you cat, leave it to the experts, just get out fast. 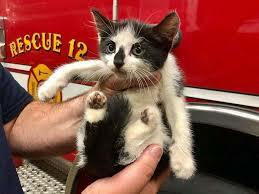 You should let rescuers know that there is a cat inside that needs to be rescued. Do this by purchasing decals that say “In case of a fire, please rescue cat.” Put them in a few prominent places and keep them there at all times. Having a decal on the door or windows will let firefighters or police know right away that there is a pet inside that needs help! These few seconds could mean life or death of a pet member. Always have a plan that includes the rescuing of your pet in the event of a fire or other disaster. The best oldies of all time are a click away. Edgewater Gold Radio playing the greatest oldies from the 50s through the 80’s all the time! Listen from our website: edgewatergoldradio.com or right here: Edgewater Gold Radio. The weather is finally getting cold. Now we have to make sure that our dog is protected when outside. It’s very cool and windy here on Delmarva today and I just saw a Greyhound being walked with a warm blanket like coat on him. 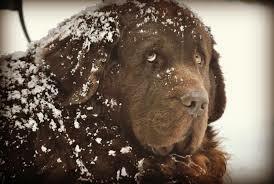 Some dogs are more sensitive to cold weather than others. Make sure you take the proper steps to protect your dog this winter. Pets.WebMD has put together a thorough guideline on how to protect your pets this winter. Make sure you this article as your checklist! Our 60s and 70s weekend continues on Edgewater Gold Radio! Join us for the best oldies. Download the free Edgewater Gold Radio app today. Listen on our website: edgewatergoldradio.com. Your Dog Gives You A Big Wet Kiss…Then…..UGH! It’s a 60s and 70s weekend on Edgewater Gold Radio! The best mix of oldies are in one place! Download the free Edgewater Gold Radio app, listen on tunein or on our Edgewater Gold Radio app. Tell Google or Alexa to “Play Edgewater Gold Radio! Listen from our website: edgewatergoldradio.com. add comment Comments Off on Your Dog Gives You A Big Wet Kiss…Then…..UGH! In Rehoboth Beach, Delaware, the Sea Witch Festival takes place next weekend. One tradition is that many people dress their dogs in all sorts of great costumes. There a dog parade on the Sunday of the event. 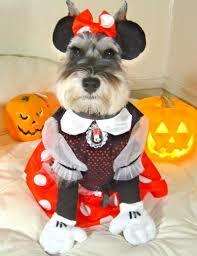 I always notice lots of Miniature Schnauzer’s dressed as everything from princesses to political figures. I thought that I would provide some information about the Miniature Schnauzer today. The Miniature Schnauzer is a small sturdy dog with a square head. They are very intelligent, active and happy dogs. They get along great with children and really enjoy being around “their” people. The are loving, affectionate and docile animals. The Schnauzer makes a very good family pet. They cannot sense that they’re stronger minded than their owners or they won’t listen. So you must be firm with them. These dogs are easy to travel with as they love to go on trips with you. Don’t overfeed them because they tend to gain weight easily. The Miniature Schnauzer makes a good apartment dog. They will be calm indoors as long as they get plenty of exercise. Take them for long walks on their dog leash but be sure that you’re the leader and that they get enough exercise. When you get to work today, turn on your favorite oldies. The best music from the 50s 60s 70s and 80s. Enjoy your memories with great oldies —Edgewater Gold Radio. Listen to Edgewater Gold Radio by saying “play Edgewater Gold Radio on your google or Amazon Echo device. You can also listen from our website: Edgewatergoldradio.com.